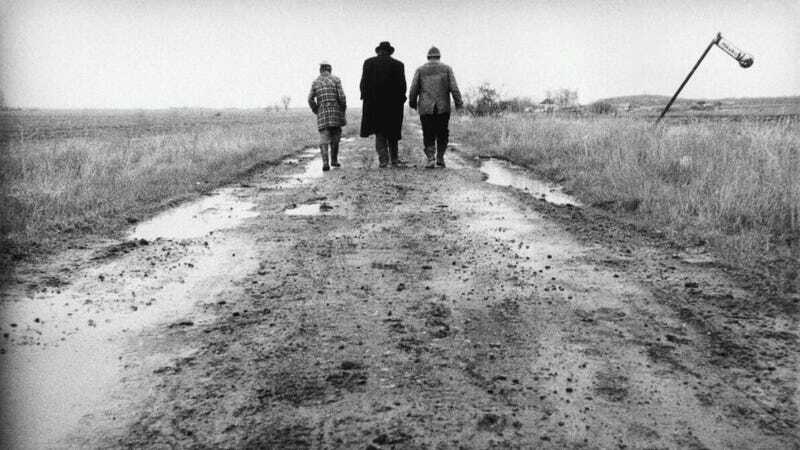 When it comes to difficult-but-rewarding modern art, few films can compete with the reputation of Sátántangó, the 7 ½ hour magnum opus of the Hungarian director Béla Tarr—a blackly comic allegory of boundless pessimism and squalor, set at a decrepit collective farm lost in rain, greed, small-mindedness, and the influence of a pseudo-messianic sociopath. It’s structured in 12 overlapping chapters, but it’s probably best to see the film in a single sitting and get dragged as deep as possible into Tarr’s bleak, Brueglian universe, as experienced in surreal and unsparing black-and-white long takes. (There are only about 150 cuts in the entire thing.) David Lynch’s Twin Peaks is about the subconscious evil lurking behind a small-town soap opera; Sátántangó—as well as Tarr’s later, shorter, artistically related Werckmeister Harmonies—starts with an already failed and miserable community, and finds the empty void behind its façade. In the most recent edition of Sight & Sound’s legendary once-in-a-decade poll of the greatest films ever made, the film tied for 35th place with Psycho, Metropolis, and Jeanne Dielman, 23 Quai Du Commerce 1080 Bruxelles. If this sounds like your thing (and you can stomach a very convincingly simulated cat poisoning), then you’re in luck. As Indiewire reports, the Los Angeles-based boutique distributor Arbelos Films is working on a 25th-anniversary 4K restoration of Tarr’s masterwork, which has screened sporadically in the United States since it first premiered in 1994. The restored Sátántangó should hit arthouses in early 2019, with the film’s first-ever Blu-Ray release to follow. Tarr himself formally retired from directing after 2011's The Turin Horse to concentrate on teaching (László Nemes, director of the Oscar-winning Son Of Saul, is one of his protégés), though he presented a new short film as part of an installation piece in the Netherlands last year.